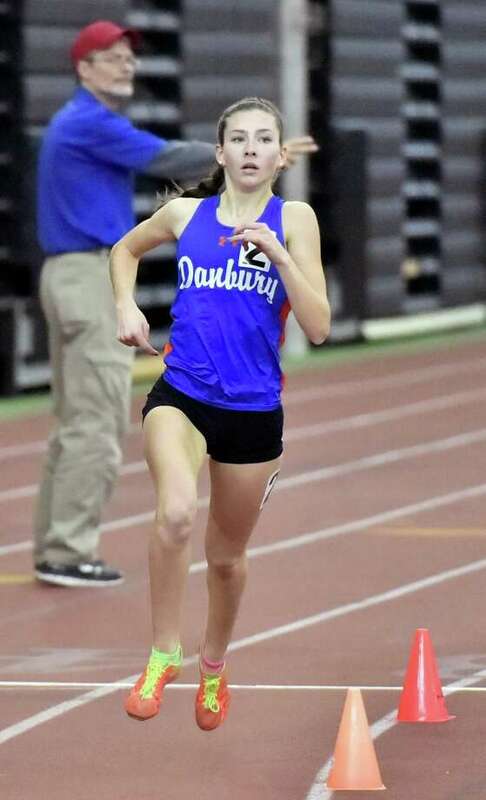 Danbury High’s Lauren Moore wins the 1600-meter run in the 2018 State Class LL Girls and Boys Indoor Track and Field Championship at the Floyd Little Athletic Center in New Haven. The Danbury boys and girls track teams each boast an athlete set to chase down a national goal. Always loaded with high-end talent and depth to boot, the Hatters are set for another medal-filled winter. The indoor track season is well underway on Clapboard Ridge, where a number of trophies have come home the past several years. Danbury’s boys team has won three straight Class LL and State Open titles indoors, and swept the titles last outdoor season. Danbury’s girls own the past three Class LL indoor championships. But the path to those titles is always difficult. Scoring enough points in the final meet to claim the championship often takes several elite athletes. Seniors Malcolm Going and Lauren Moore have both competed at the highest level on several occasions during their stellar careers, and are capable of doing so again at The Armory in March. Going won the New England title in the 600 last season and took eighth place at New Balance nationals in the 800; he’s the fifth fastest returner from that race. Moore placed seventh at outdoor nationals in the 1,600 after a stellar season. With a squad of 110 this winter, Murray has plenty of talent at his disposal. Putting players in the right pieces is always the early-season goal for the Hatters, who have several competitive meets before the championship run. In fact, Danbury will have run at The Armory a handful of times before even thinking about nationals. Going, Malachius Lorick (sprints) and Ryan Caldwell (distance) will captain the sizable squad. Lorick was part of several relays over the last year, including the 4×400 quartet that won the New England Championship indoors. Jacob Hefele is the squad’s top distance runner, having competed at the State Open last outdoor season. Alexander Beiku and Shay Fahsbender lead the hurdlers while Jaden Cazorla and Luka Santos will be key jumpers. Danbury began its season over the weekend at the The Amory for the Coaches’ Hall of Fame invite. Sprinter Malik Thomas didn’t run outdoors last year but posted a 6.60 time — which would have placed at the State Open — in the 55 dash. The Hatters girls team hopes the momentum coming off the best season in cross country program history — that included FCIAC, Class LL and State Open titles — translates to the track season, as several key contributors from that group could score points in the postseason. Moore won the 1,600 at the New England championships last June outdoors before competing at nationals. Cassandra Sturdevant took second in the 1,000 last outdoor season and was one of the top runners behind Moore as the Hatters swept the cross country titles. Class LL 100-hurdle champion Jaylyn Carter returns to potentially help the Hatters score points. Shanell Stewart will be a key sprinter while Meilee Kry leads the jumpers. Freshmen Ariel Williams and Giuliana Robles are potential contributors, Fraticelli added. Danbury will have to replace two key athletes who led it to a FCIAC and Class LL championships last outdoor season, as Leah Sarkisian (middle distance) and Celyna Custodio (thrower) graduated.